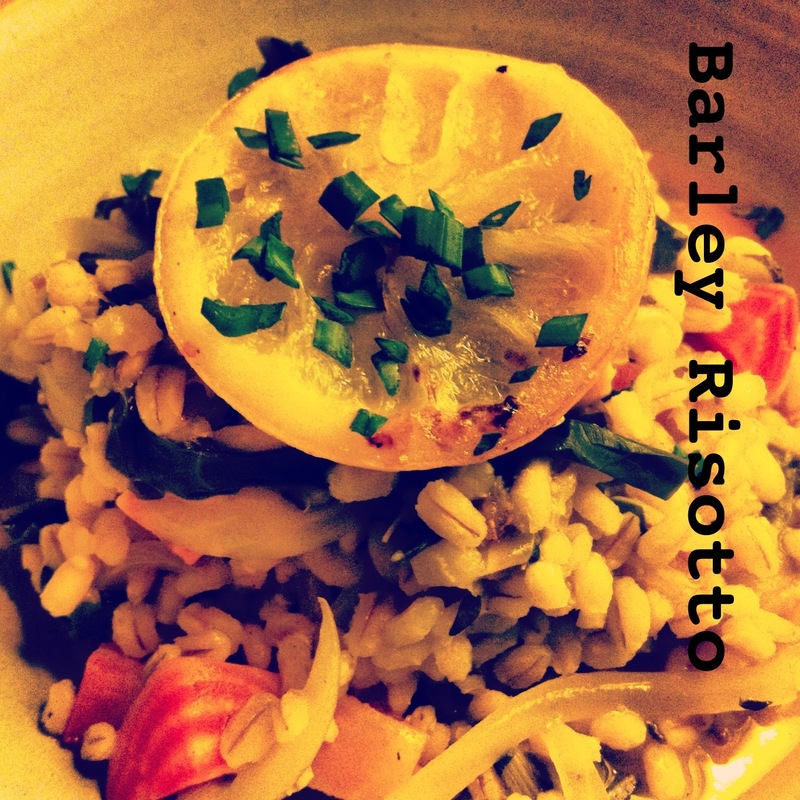 Barley risotto. Well first of all, you might know of our love affair with risotto. You can read about it here, here, here, and here. And not to be too repetitive, but yes, another beet risotto recipe. I promise you, if you can’t get with beets or risotto, you should try this and I guarantee it will convert you. It started with a recent trip to a farmer’s market a few towns over to scout out other vendors/farms and see some “competition”. While we were there, I saw some beautiful chioggia beets. I had just asked Farmer B what we wanted for dinner and he said something with beets, so really it was destiny. I had a new bag of pearled barley (I can’t find whole barley anywhere, so I need to go order it from the Upstate Food Co-op) and an itching to cook something sophisticated. (After I put Farm Baby down for the night) I roasted the beet roots with olive oil, salt and pepper and then I thought while the oven is on, I might as well roast everything. So I threw some whole, unpeeled garlic cloves and a couple slices of lemon on the baking sheet and threw it in. I defrosted some homemade chicken stock, thank you Blondie (an old Red Star hen that we recently harvested), sliced an onion, threw on some tunes (Alabama Shakes) and got to cookin’! 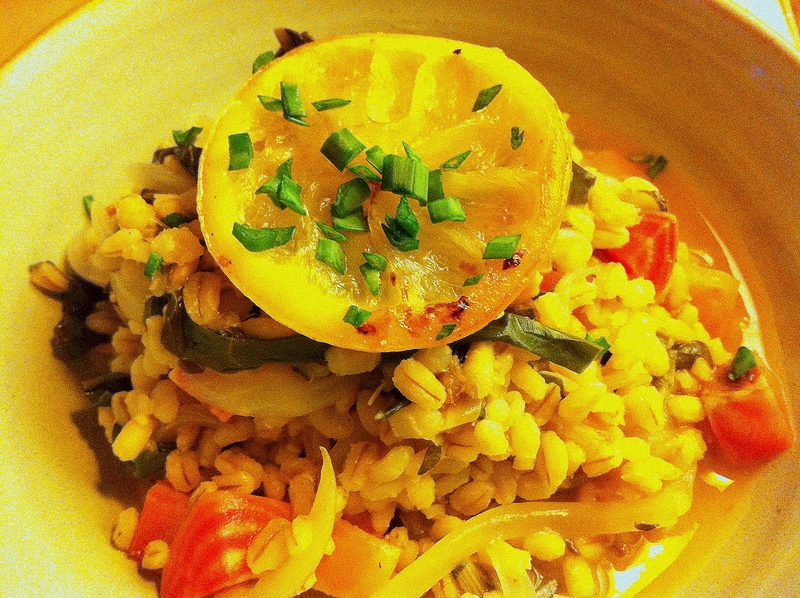 If you just can’t get with the beets, please, please try barley in place of arborio rice next time you make risotto. The barley is nutty and chewy.The flavor and texture completely out-do arborio rice. I will say if you plan on a soft, delicate risotto, like this one, I might not use barley. It is hearty and the other ingredients need to stand up to it. You can use the below recipe as a guide to cooking the barley risotto, but if you don’t want to read the recipe and want the quick version: soak the barley (1-2 hours) and rinse very well, while you don’t need more liquid, it does take more time than rice, so plan for 45 minutes – 1 hour. Barley risotto doesn’t get creamy like arborio. Beets. Trim off the top greens, wash thoroughly, and slice into ribbons. Peel the root and chop into 1/2-inch pieces. Spread on oiled baking sheet. Season with S&P. To the greased baking sheet, add the lemon slices, sprinkle with salt and drizzle with EVOO. Place garlic cloves on a small sheet of aluminum foil, drizzle with EVOO, S&P, set on baking sheet. Place the baking sheet in the oven. Watch carefully as you don’t want the lemon to burn, but you do want a little color. I thought I would have to pull the lemons out before the beets were done, but they finished at the same time, around 20 minutes. Continue roasting the garlic cloves packet for another 10 minutes. Remove and let cool. When cool enough to handle. Squish garlic out of cloves and chop/mash. Set aside. While the beets roast, get out your risotto cooking pan. Set heat to medium, add EVOO. Once heated, add onion slices, season with salt, and saute until soft and tender, about 10 minutes. Add fresh thyme and parsley. Add barley. Turn heat to high. Toast for at least 3 minutes until the pan is dry and the aroma is nutty. Deglaze pan with wine or stock. Turn heat down to medium and let it simmer until all the liquid is absorbed. Add more stock. Continue adding stock after the liquid is absorbed until barley is cooked, adjusting heat as needed to keep things simmering. This took me about 5 cups of stock and about 50 minutes. I keep a separate pot of simmering stock, right next to my risotto pan. This helps keep the risotto simmering and cuts down on time. About halfway through the cooking process (judging by the amount of liquid you have leftover) add chopped beet greens to pan. Continue cooking. Just before serving, add roasted garlic into risotto. Distribute evenly. Season with S&P. To serve, ladle risotto into bowls or onto a plate. Top each serving with a slice of lemon and fresh chives and parsley. To eat, smush (the technical term) lemon into risotto. Discard rind. Devour. Note: We are steering clear of dairy currently, but I bet this would be divine with some fresh goat cheese on top. Second note: Sorry for the crappy pictures. Taken at night with iphone. Never a great combo. This entry was posted in dinner, risotto, Uncategorized, Vegan, Vegetarian and tagged barley, beets, chioggia beets, risotto by callywoodfarms. Bookmark the permalink.